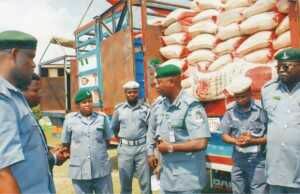 Nigeria Custom Service seized 572m worth of goods (contraband) - BlogIT with OLIVIA!!! THE Nigeria Customs Service (NCS), Federal Operations Unit, Zone ‘A’, Lagos has seized various contraband items valued at N572 million.The prohibited items range from imported frozen poultry products, foreign parboiled rice, vehicles, vegetable oil, trucks of unprocessed teak woods and other general mer­chandise. According to the Controller of the unit, Umar Mohammed Dahi­ru, who gave the breakdown of the seizures, the items included 4,911 bags of 50kg parboiled rice, 15,048 cartons of imported frozen prod­ucts, 1,884 gallons of vegetable oil, 17 trucks of unprocessed teak woods and unspecified number of general merchandise by his opera­tives through intelligence.He stated that the latest onslaught came against the backdrop of the recent directive on the ban of rice importation through land borders by the NCS management. The Controller further hinted that three brand new Toyota Prado Sport Utility Vehicles (SUVs) were also intercepted during the same period. He, however, confirmed that the agent had been requested to produce the Customs documents, which will provide the necessary clue on the status of the vehicles.The Controller emphatically pointed out that what made the sei­zures of the frozenpoultry products remarkable was the circumstances and mode of concealment. He disclosed that most of the seized frozen poultry were carefully con­cealed with frozen fish ostensibly to divert the attention of the opera­tives. He confirmed that at other in­stances, cooling vans were used in concealing the products with the same criminal intent.On rice, the Controller clarified that importation of the staple food has been restricted to the seaports as against the border stations and warned rice importersto adhere strictly to the latest policy or be ready to face the full wrath of the law.On the recent visit of the Comptroller General of Customs, Hammed Ibrahim Ali,he stated that it was aimed at strengthening op­erational ties with the critical stake­holders as well as to brainstorm on areas of hiccups with a view to ensuring seamless collaborations that will enhance the revenue gen­eration capacity of the Nigeria Cus­toms.“The Comptroller General of Customs andhis management are working tirelessly despite the pres­ent harsh economic challenges to re-position the Service for greater efficiency and functionality.